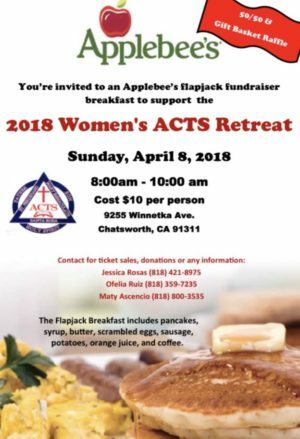 You are invited to an Applebee’s Flapjack fundraiser breakfast to support the 2018 Women’s ACTS Retreat on April 8, 2018 from 8:00 AM to 10:00 AM at the Applebee’s located at 9255 Winnetka Ave. Chatsworth, CA 91311. For Just $10.00 you can enjoy a delicious Flapjack Breakfast that includes pancakes, syrup, butter, scrambled eggs, sausage, potatoes, orange juice, and coffee! The best part is that you get to fellowship with brothers and sisters from our ACTS Community while supporting the 2018 Women’s ACTS Retreat. Funds raised from this fundraiser will go towards the Retreat scholarship fund. ACTS is a Catholic weekend retreat designed with the purpose of engaging Catholics in their faith lives, especially within the parish community. It is not a vacation, but rather an opportunity to get away from the pressures of everyday life and deepen your relationship with God. © Santa Rosa Church ACTS. All Rights Reserved. Created by Websites for Catholics.